Citation: C N Trueman "Supermarine Spitfire"
The Spitfire, along with the Hurricane, was the mainstay of Fighter Command in its victory over the Luftwaffe in the Battle of Britain. The Spitfire was to become the symbol of the battle and later versions made a key impact in battle fought after D-Day. The Spitfire was built by the Supermarine Company. The fighter plane was what Sir Hugh Dowding, head ofFighter Command, believed the country needed if it was to defend itself against the might of the Luftwaffe. Designed by Reginald Mitchell and feared by the Luftwaffe’s pilots, the Spitfire had speed, firepower and manoeuvrability as its strong points. When asked by Goeing what he needed to win the Battle of Britain, Adolf Galland, a noted Luftwaffe fighter ace, is said to replied “a squadron of Spitfires”. However, for all its performance, the Spitfire did have its problems. If the plane was hit, it burned easily and quickly. The huge Merlin engine needed plenty of aviation fuel and a large percentage of the fighter plane was given over to storing fuel. If the plane was hit, it could quickly catch fire. This put the pilot in extreme danger as the cockpit was difficult to get out of. The original members of the legendary Guinea Pig Club from the Burns Unit at Queen Victoria’s Hospital, East Grinstead, West Sussex, were invariably fighter pilots from the Spitfire or Hurricane squadrons that flew in 1940. 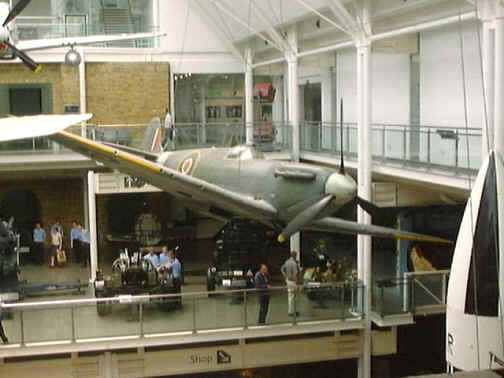 The maximum speed of the Battle of Britain version was 361 mph. It was armed with eight .303 inch machine guns.